We are an independently owned & operated bakery business in huntsville, Alabama. Owner Ally Burnett was born with an insatiable need to "create", and her creativity has followed her through life in two forms: music, and baking. For most of her life, Burnett pursued the former with passion and sheer tenacity. Following her heart paid off, and she eventually landed her songs on big name TV shows like Jersey Shore. However, after nearly a decade in the music industry, she decided to hang up her microphone to pursue a career as a pastry chef. What started as a side business selling baked goods to friends during the holidays eventually led to bigger catering gigs. In 2013, Burnett created 1,350 pieces for a large scale charity event, and by 2015, she landed the role of pastry chef at fine dining restaurant Cotton Row. Burnett studied professional chocolatiering & business at Ecole Chocolat and graduated the program with honors in December 2016. She hopes to someday earn the title of Master Chocolatier and study at Valrhona's Ecole du Grand Chocolat in Tain l'Hermitage, France. Ally's intense love of food is also showcased on her blog, ﻿Ally Eats World﻿. 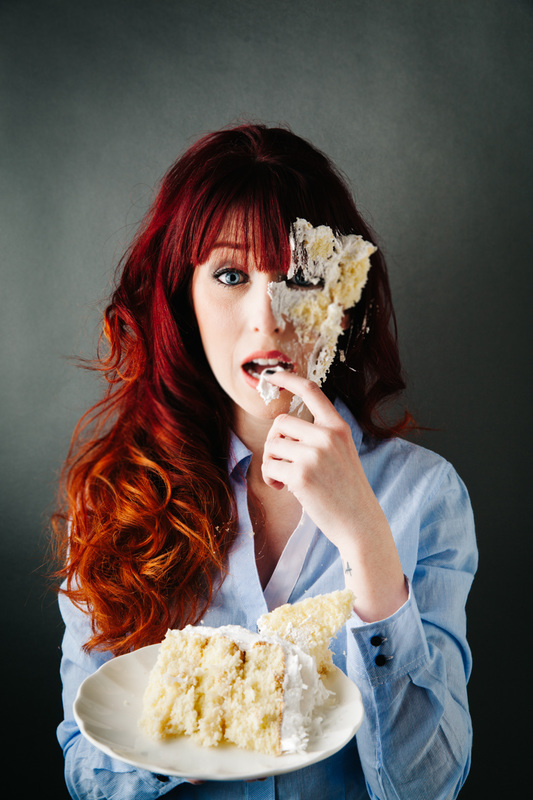 Owner & Pastry chef gets a cake to the face in a shoot with birmingham based photographer cameron carnes. We love what we do, and know you will too! Visit our gallery for samples of our work. Visit the gallery on our homepage to see what we can do!